Exude your femininity with the new Chance Super One by Mauboussin, a collection that evokes gentleness and of delicate beauty. Designed with a diamond set on a lucky symbol – the clover, and the band with paved diamonds, Chance Super One collection bestows luck and beauty upon you with options of white, yellow or rose gold to choose from. For the launch of Chance Super One, a limited time exclusive offer awaits you from now till 21 Apr 2019 at our store at Wisma Atria! 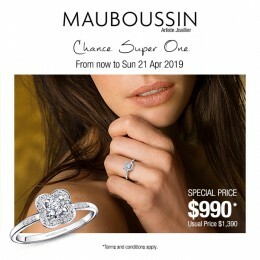 Purchase a Chance Super One ring at S$990* only (usual price S$1,390). Visit us now at Wisma Atria #02-14/15 Tel: +65 6733 0571. 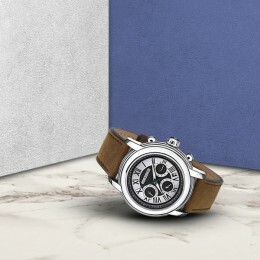 The new ‘Right Time Man’ chronograph for men is a striking piece of watch meant to create an impression. The silver/black layered dial against the sleekness of polished steel and the texture of brown aged leather strap easily catches the radar of the human eye. Equipped with an automatic movement, ‘Right Time Man’ possesses everything you need for all dress code. Life Time, Mon Amour timepiece for men by Mauboussin A matte layered dial in dark grey with clous de Paris pattern against the sleekness of polished steel is a result of a great contrast – distinguishing and classy. 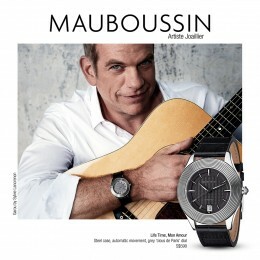 The new Life Time, Mon Amour timepiece with automatic movement for men by Mauboussin encapsulates this distinctiveness. A matte layered dial in dark grey with clous de Paris pattern against the sleekness of polished steel is a result of a great contrast – distinguishing and classy. 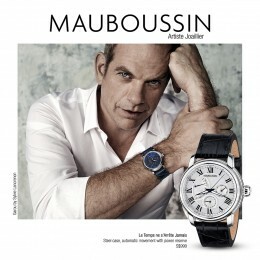 The new Life Time, Mon Amour timepiece with automatic movement for men by Mauboussin encapsulates this distinctiveness. Le Temps ne s’arrête jamais – the new automatic timepiece of superiority and precision for the modern and discerning gentlemen. A classic white or blue dial in automatic movement with power reserve indicator, this elegant timepiece is a revelation of creativity of Mauboussin, demonstrating its savoir-faire in today’s watch-making industry. One design, seven stunning colours, three choices of gold, your capsules in life begin with the new “Capsule d’Emotions” collection by Mauboussin. Get your perfect dose of emotion now; or fulfill your whims by stacking up the colours on your finger. The new “78 Tours” ultra-slim watch is inspired by phonograph record. The watch case embodies the vinyl in the form of a flat disc with an inscribed, modulated spiral groove as seen on the bezel of the timepiece. Spin “78 Tours” on your wrist now! Etoilement Divine The divine star… A symbol of beauty… The new ‘Etoilement Divine’ by Mauboussin embraces the stunning and heavenly emblem. 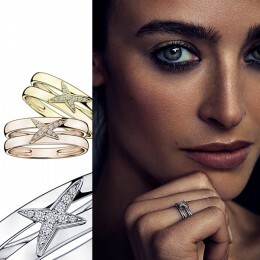 The divine star… A symbol of beauty… The new ‘Etoilement Divine’ by Mauboussin embraces the stunning and heavenly emblem. When love is felt every moment, temperature rises, passion soars! This overwhelming state of emotion is the flow of lava from a volcano that floods a peaceful valley. 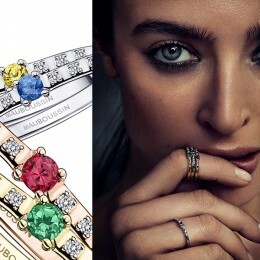 The new ‘La Passion est un Volcan’ collection by Mauboussin epitomizes this passion. The new Etoile Sublime series is an elevation of a level of purity and excellence. A beautiful design in combination of black ceramic and white gold with an iconic star paved with diamonds, embedded on a cushion-like black enamel. The band is designed with a space to remind us the necessity to pause and breathe the exuberance of life! A perfect epitome of the women of today!